Our guest blogger today is CRM MVP Aaron Elder with some of his characteristic “forward looking” observations. Architect.Microsoft .NET 4.0 is almost upon us and should be released in the next couple weeks (April 12th, 2010). There are so many cool things in .NET 4.0 framework as well as the CLR and languages like C# 4.0. I recently spent some time playing around with one of my favorite new features found in the Parallel Extensions Parallel.For / Parallel.ForEach and to also try out optional parameters. As you may have read in my post on the topic, you unfortunately will not be able to make use of .NET 4.0 for CRM plug-ins or other code that runs in-process with Microsoft Dynamics CRM 4.0 (Since CRM is compiled against the .NET 2.0 CLR). However, you can definitely use .NET 4.0 with Microsoft Dynamics CRM 4.0 if your code is running out-of-process, such as on a separate web site, console app, Windows service or integration. Fortunately, we can all look forward to using .NET 4.0 for CRM 5.0 extensions and more. Parallel Extensions in .NET 4.0 provide all kinds of cool stuff, but at its core these extensions allow you to very quickly and very easily add multi-threading to your applications with very little effort. While the old method of creating and managing a thread pool is still available and still needed, for many simple scenarios you can shortcut all that coding and get threading with basically a single line of code! As you can see, add one additional CPU to the mix, provides an approximately 40% increase in throughput. // time a CRM Service is created. // How long did all that take? // Was a service already created for this thread ID? 1. 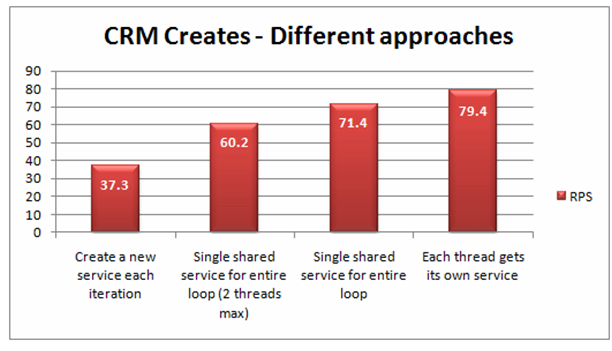 Create a new service each iteration – This method involves creating a new CrmService within the “For Loop” and thus giving each thread its own copy of the service. 2. Single shared service for entire loop – This method involves creating a single CrmService instance outside of my “For Loop” and using it for all requests. 3. Single shared service for entire loop (2 threads max) – Same as #2, but I used the ParallelOptions MaxDegreesOfParallelism to limit the loop to only 2 threads. I wanted to see if I could “out smart” the Parallel Extensions framework and prevent extra unneeded context switching. 4. Each thread gets its own service – In this model, I created a factory that uses the current thread context to create a unique CrmService instance per thread. This method is what is illustrated in the code sample provided. 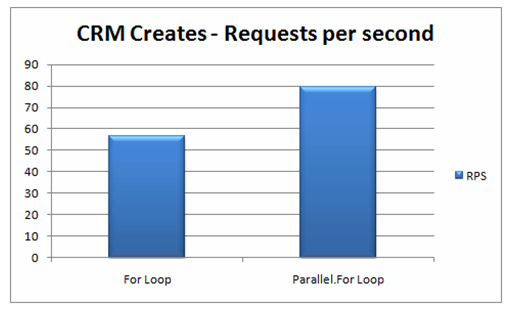 This method yielded the best performance and is similar to other multi-thread solutions we have built for CRM in the past (only with a lot less code). The properties on this class are copied into a new instance of a WebRequest object for each XML Web service method call. While you can call XML Web service methods on the same WebClientProtocol instance from different threads at the same time, there is no synchronization done to ensure that a consistent snapshot of the properties gets transferred to the WebRequest object. Therefore, if you need to modify the properties and make concurrent method calls from different threads you should use a different instance of the XML Web service proxy or provide your own synchronization. Internally, this all comes down to the WebClientProtocol and WebRequest objects, which are making synchronous and thus blocking calls to the actual Microsoft Dynamics CRM ASMX web services. By creating a separate instance of the CrmService per thread, we are reducing the amount of contention for the same resources and since we have upped the process maximum HTTP connections, we don’t have to wait for underlying connections to be made available either. As MSDN notes above, details from the client are copied to each WebRequest object, it is important that you not use this factory approach with UnsafeAuthenticatedConnectionSharing across multiple threads when you are dealing with multiple user contexts. Since the system will not re-authenticate the user, all requests will be assumed to be happening by the same user. This is great for data migrations, but not so great for cases where you need CRM to know about the user making the call.